“Where do you want to be in 25 years when they give us an award for not being dead yet? The Neo Maxi Zoom Dweeby of Teen Angst. So this is where the punch dance was invented! Ah, to know what we know now, back then. How many times has that lament been our adult refrain? Well, these kids actually do! At least, they know back then what John Hughes knows now. About us back then. THE BREAKFAST CLUB put five “brat pack” kids on moviedom’s radar – from which none of them recovered. Forever stamped as teenies, never gaining prominence again except as nostalgia ornaments, they probably all ended up as mentally screwed as the characters they played here. Also thrust Scottish band Simple Minds into the world spotlight with the throwaway single, Don’t You (Forget About Me). Can’t turn back now – it’s injected into our memory nerves. Of all the dumb teen angst movies of the yuppie consumerist 80’s, this was surely the best, writer-director Hughes hitting it outa the park with the story of five high school kids stuck in a Saturday detention at Shermer High School (analog for AnySchool USA), October 1985, and discovering themselves as only people on a ship lost at sea might be inclined to, after months of no rescue and having eaten a few fellow passengers. There’s the princess, Claire (Molly Ringwald, fiery locks and pouting lips that many a young lad imagined glorious use for), the goth chick, Allison (Ally Sheedy, who ties back her hair to become “beautiful” and simultaneously overcome her psychological problems), the shapeshifter, Andrew (Emilio Estevez, who still looks exactly the same today), the neo maxi zoom dweeby, Brian Johnson (Anthony Michael Hall with a calculator watch, taking time out from AC/DC to do this movie), and the level-one seisomorph, Bender (Judd Nelson, years before he became Robert Downey Jr. or the robot on Futurama). After Bender shows us how rebellious he is by actually turning up for detention, Paul Gleason (as the teacher, Mr. Vernon) does his Neidermeyer from ANIMAL HOUSE, while giving Dio a great idea on usage of the devil sign. Emilio invents the punch dance, which Kevin Bacon would steal, and Molly Ringwald eats sushi to prove how upper class she is. A documentary called DON’T YOU FORGET ABOUT ME, made in early 2009 (just before John Hughes’s death), follows five college kids trying to locate the recluse Hughes to beg him out of retirement. Or at least make an appearance for his throng of teenie-movie fans. Watching that feature (and its attendant interviews with BREAKFAST CLUB cast and others), you’d think Hughes was some kind of genius. He was a good filmmaker, but no genius. His films have become iconic almost in the same way Capra films capture an idealized version of “back then.” But they have nothing to do with reality, which I’ll prove indisputably in a moment. They’re quite aware of what they’re goin’ through. 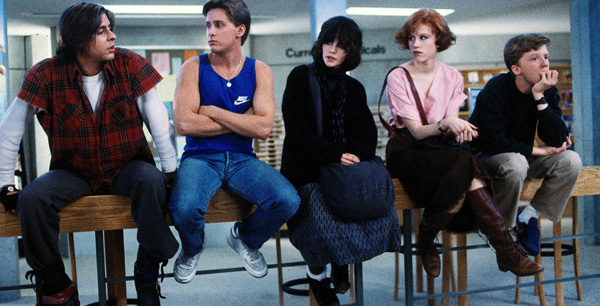 THE BREAKFAST CLUB is rare in the pantheon of “teen comedies” because it is dialogue driven. It’s TWELVE ANGRY MEN in detention with hormones. Hughes miscalculated how good his dialogue was and sprinkled the film with unnecessary asides and cringeworthy dancing. These are the least interesting sequences. There’s a lesson right there, dweebs. Didja take it? No. There is much to enjoy in the revealing and insightful exchanges, but there is an undercurrent of fakery about it too, a pretension that this fantasy could be taken as more than it is. Let’s face it, all you children that have been spat on: which one o’ y’all chummed up to someone outside your clique on the heels of this film? Case closed, Yeronner. Starring: Judd Nelson, Molly Ringwald, Anthony Michael Hall, Ally Sheedy, Emilio Estevez, Paul Gleason, John Kapelos.